Click here to go to 'Figures/Overheads' section. Click here to return to course outline. Basaltic igneous rock formed by decompression melting of the mantle as it rises convectively towards the Earth's surface is not only the dominant rock type within all the world's oceans but is also the progenitor of nearly all other rocks composing the near surface crust. Basaltic rocks are composed of plagioclase and clinopyroxene, and in addition either orthopyroxene and quartz, or olivine and orthopyroxene (tholeiitic basalt), or olivine and nepheline (alkali basalt). The variation in mineral composition reflects the degree of SiO2 saturation of the basaltic melt, basalts with olivine and nepheline being the least saturated and those with orthopyroxene and quartz the most saturated. The variation in basalt composition is illustrated by what is known as the basalt tetrahedron. The texture and in particular the grain size of igneous rocks depends on their mode of formation. Intrusive rocks crystallized at depth (plutonic rocks), tend to cool slowly and therefore to be coarse grained, whereas extrusive rocks that crystallize rapidly at the Earth's surface (volcanic rocks) are usually fine grained. Thus granite is equivalent to rhyolite, diorite to andesite, and gabbro to basalt. Hyperbyssal rocks that crystallize in the form of dikes, sills and sheets, may exhibit an intermediate grain size. Fine grained volcanic rocks containing floating crystals (phenocrysts) of plutonic material are named using the prefix 'phyric', as in plagioclase-phyric basalt. Aphyric basalt is a basalt composed only of fine grained material. Where the phenocrysts are large relative to the crystalline matrix of the rock, the rock is called porphyritic. If the crystals cluster together to form petal like aggregates they are called glomeroporphyritic or glomerophyric. As basalt cools it changes composition according to the composition of the minerals removed from the liquid; this process is called fractional crystallization. If the basalt cools in a magma chamber, the minerals that settle to the floor of the chamber (igneous sedimentation) form a class of rocks known as cumulates, e.g. wherlite (olivine and clinopyroxene), websterite (olivine and orthopyroxene), troctolites (olivine and plagioclase), norite (clinopyroxene, orthopyroxene, and plagioclase), and gabbro (clinopyroxene and plagioclase). 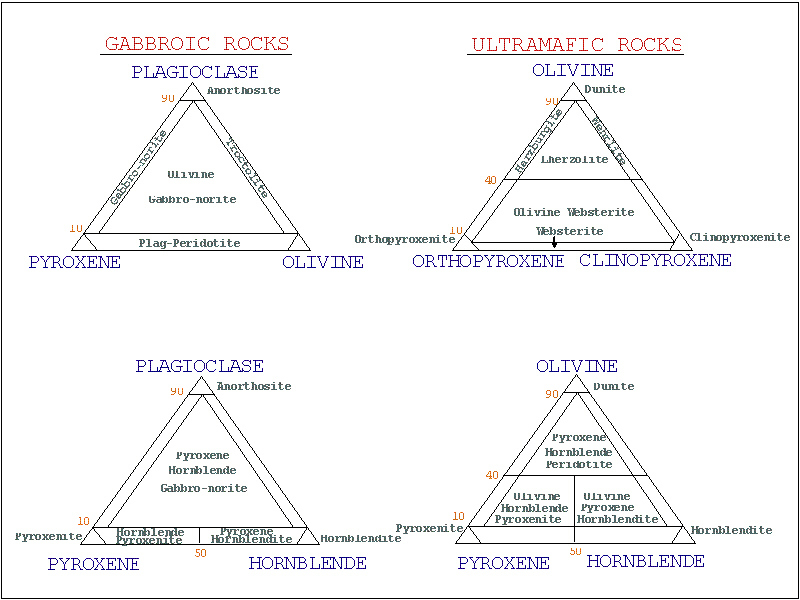 Classification of ultramafic and gabbroic rocks. Minerals crystallize from basalt in the order known as 'Bowen's Reaction Series', according to which the earliest minerals crystallizing are chromite and olivine, followed by pyroxenes and plagioclase - and perhaps amphibole if the melt contains water - and finally quartz, orthoclase, and micas. Depending on the composition of the basaltic magma the crystallization of olivine may be followed by clinopyroxene or plagioclase. In the case of the basalts of mid-ocean ridges, the order of crystallization is olivine -> plagioclase, and then clinopyroxene. At low pressures, basaltic liquids that should crystallize orthopyroxene will crystallize olivine instead, a process called incongruent crystallization. Consequently, the melt will become enriched in SiO2 (quartz). Since mafic minerals that crystallize from basalt contain no K2O and relatively little Na2O, the liquid will also become enriched in these elements. Igneous rocks enriched in these elements are therefore classified using a triangular plot known as a 'Streckeisen diagram', where the apices of the triangle represent Quartz, Plagioclase, and K-feldspar. >64 mm bombs            Sub-Plinian         |Surt. or Phreato. Fragmental igneous rocks are known as autoclastic when the brecciated nature of the rock is due to the incorporation of already solidified material into still liquid rock, and pyroclastic when the brecciation is due to explosive processes. Pyroclastic rocks further subdivided into types characterized by the deposits found in association with the volcanoes of Hawaii, Stromboli, and Plinia. During Middle Proterozoic times (1.4-1.0 Ga), orogenic belts such as the Grenville and Nairn Structural Provinces of Canada and the Svecco-Norwegian of Scandinavia were intruded by igneous complexes characterised by the presence of large coarse grained bodies composed almost entirely of cumulate plagioclase and intercumulus orthopyroxene. They are surrounded by orthopyroxene- and clinopyroxene-bearing rocks of variable quartz content (dioritic to adamellitic) known as Jotunite, Opdalite, Mangerite, and Farsundite (from their Norwegian type localities). Hyperthene-bearing alkali granites found as isolated bodies associated with high grade granulite facies metamorphic rocks are known as 'Charnokite' after rocks of this name in southern India. Classification of the anorthosite suite. Rocks of the anorthosite suite are also commonly associated with gneisses of the granulite metamorphic facies (e.g. Morin Anorthosite north of Montreal, and elswhere in the Grenville Structural Province of Ontario) and often contain garnet and minor amounts of amphibole and biotite. A minor but economically important component of the Anorthosite suite includes intrusive sheets of rock composed of ilmenite and apatite. Structural Provinces of North America. Figure 3. The Basalt Tetrahedron. Figure 4. Classification of ultramafic and gabbroic rocks. Figure 5. 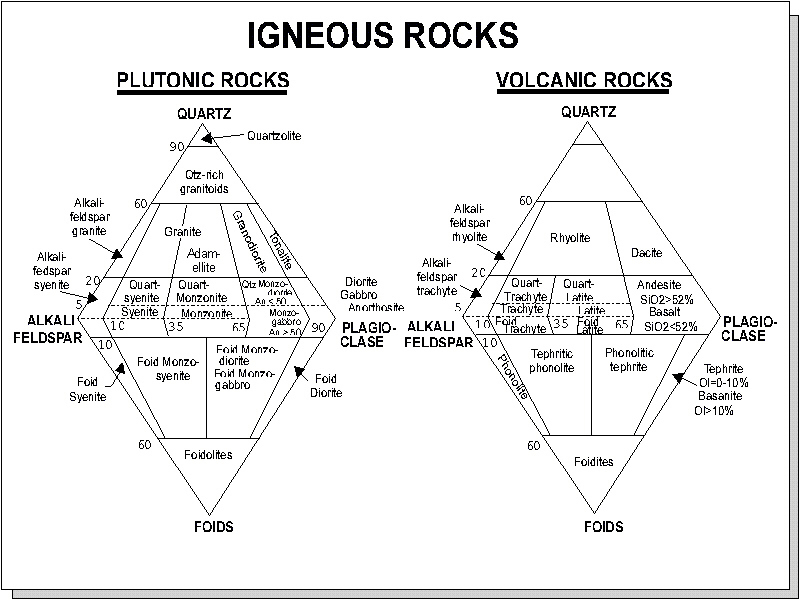 Crystallization of igneous rocks. Figure 6. Classification of granitic rocks. Figure 7. Classification of the anorthosite suite. Click here to return to beginning.